Amidst reports of an alarming uptick of anti-Semitic vandalism and bomb threats against JCCs (and an even more alarming reluctance of our new president to even admit its existence), I can’t help but think of an email exchange I had with my friend and colleague Rabbi Rebecca Lillian three years ago. Rebecca lives in Malmo, Sweden, a city that has seen its share of anti-Semitic vandalism and violence over the past several years. In 2012, the Malmo JCC, where Rebecca lives was vandalized by heavy rocks and an explosive device that thankfully did little damage. In a subsequent blog post for Jewschool, she wrote about the trauma of the incident, but also expressed her dismay that American Jewish leaders exploited it to demonize Muslims and exhort Jewish citizens of Malmo to flee to Israel. Rebecca pointed out that immediately after the attack, Malmo’s Network for Faith and Understanding held a solidarity vigil in which women, men and children demonstrated their support for the Jewish community by gathering in front of the JCC with candles. Leaders of several Christian churches, two Muslim groups and other spiritual and social organizations came together and offered public speeches of support and solidarity. Needless to say, that last line has a troubling resonance when I read it in 2017 – now that a group of “equal opportunity haters” has become firmly ensconced in the White House. But at the same time, I take heart in her description of Malmo’s interfaith solidarity – particularly as I witness a similar kind of solidarity occurring in Trump-era America. Unfortunately, we know the feeling all too well as mosque vandalism and burning has spiked recently in the US. We recognize the source of hate as one, and regardless of religious affiliation, we stand together in solidarity against it as one. An attack on any is an attack on us all. Today, the congregation of this temple are in our thoughts and prayers. We are a church of Latinos, of immigrants, and we’re just worried and scared, and this guy walks in and he’s alone and asking weird questions. It was just an instinctual thing. We don’t want to turn anybody away, but we felt that something was wrong…He was not there to pray; he was not there to worship God. He was definitely there scouting who we are and what we are about. The takeway? 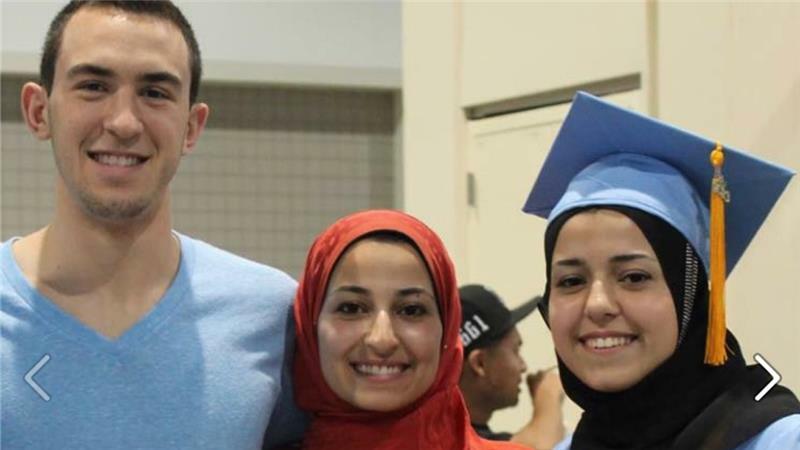 As our government – and Israel’s – continue to whip up Islamophobic hatred and brand “Muslim extremism” as the enemy, the true threat before us is the “equal opportunity hate” of white supremacy. And that the only appropriate response is – as ever – solidarity. This entry was posted in American Jewish Community, Anti-Semitism, Chicago, Current Events, Islam, Jewish Community, Religion, Terrorism on February 18, 2017 by Rabbi Brant Rosen. I’ll soon be traveling Israel/Palestine this weekend with 40 other Jews from around the world as part of a solidarity delegation to Hebron and the South Hebron Hills sponsored by the Center for Jewish Nonviolence. CJNV is a relatively new organization that has been doing important work bringing Diaspora Jews to Israel/Palestine to stand in solidarity with Palestinians in nonviolent actions against the occupation. Last year, CJNV traveled to Tent of Nations (a very special place about which I’ve written many times before) to plant trees to replace the 1,500 fruit bearing trees that had been destroyed by the IDF. More recently the CJNV participated in an action at the World Zionist Congress to protest the complete absence of the occupation from the World Zionist Organization’s agenda. The name of this new campaign is entitled “Occupation is not our Judaism” and will include work in the village of Susiya (which recently experienced home demolitions that left 26 Palestinians homeless) and planting in the nearby village of Umm Al Khair (see photo above). We’ll also be standing in solidarity with Palestinian residents of the city of Hebron – I’ll be writing more about this aspect of our work in the coming days. (This is) the most grievous injustice I have ever seen in my life … this is the worst thing I have ever seen, just purely in terms of injustice. If saying that is going to lose me readers, I don’t want those readers. They can go away and never come back. In these difficult and trying times, as we grieve the horrible murders of our people, suffer the skewed media coverage that attempts to relegate our work to the gutter, and witness the backlash that has already begun, our response must be sober and strategic. Fear is understandable. But a fierce fortitude is what is required. And a principled unity is necessary today more than ever. I look forward to sharing my experiences with you in the coming days. This entry was posted in CJNV Delegation 2016, Current Events, Human Rights, Israel, Judaism, Nonviolence, Palestine, Racism, Religion on July 8, 2016 by Rabbi Brant Rosen. Unless we fully appreciate the power of nationalism, in short, we are going to get a lot of things wrong about the contemporary political life. It is the most powerful political force in the world, and we ignore it at our peril. I recall being a bit irritated when I that article. Like many, I believed that the world had certainly learned its lesson from two cataclysmic world wars and that for all the problems that came with globalization, nationalism was a relic of the past. But I’m convinced now. And at the risk of sounding too apocalyptic about it, I’m wondering if the peril we’ve ignored is now at our door. It’s hard not to see the increasing national fervor developing all around us. Great Britain has voted to exit the European Union and other member countries are threatening to follow suit. Nationalist parties are making big gains in countries around Western Europe and Vladimir Putin has whipped a strong nationalist fervor in Russia. Many countries throughout Eastern Europe, Southeast Asia and the Far East are led by leaders who use nationalist rhetoric to win elections and promote their domestic policies. I’ve never been a fan of nationalism. I accept that nation states are part of the social, political and economic fabric of the modern world – but I’ve long believed that the nation-statism too often fuses with tribalism – particularly during time of economic instability. This phenomenon, as we know all too well, has inevitably led the modern world to dark and destructive places. As a Jew, I view the ultra-right nationalism that increasingly grips Israel’s political culture as the inevitable outcome of a nation that predicates its identity on one specific group of people. And as an American, I’m watching the toxic, seething national fervor unleashed by Donald Trump with genuine alarm. Because American national identity tends to emphasize the civic dimension (based on supposedly universal principles such as individual liberty) and tends to downplay the historic and cultural elements (though they clearly exist). Yes they clearly do exist in this country. Even if Trump loses in November – and I do believe he will – the sick nationalist fervor he has unleashed will not vanish overnight. Nor will the nations around the world that are currently increasing xenophobia, racism and fear of the other. I can’t help but think about the political excesses of the 1930s, the protectionism and the xenophobic zeal that were all part of the Nationalistic wave that swept the world following the First World War. It ultimately resulted in Japan’s invasion of Manchuria, Nazi Germany’s invasion of Poland and Japan’s bombing of Pearl Harbor, ending with Hiroshima. Something to think about as we grapple with the challenges facing our world today. This entry was posted in Current Events, Elections, Europe, Great Britain, Israel, Politics, Racism, Russia, War, World on June 25, 2016 by Rabbi Brant Rosen. I can’t help but be struck a certain absurdity at the heart of Netanyahu’s invitation. Why should European Jews move to Israel? After all, it could be compellingly argued that Israel is already a European nation. Israel was, after all, born of a distinctly European ideology; indeed, the roots of political Zionism are buried firmly in the soil of 19th century European nationalism and colonialism. Zionist figures from Theodor Herzl (whose novel “Altnueland” imagined the Jewish state in Palestine à la 19th century Vienna) to former Prime Minister Ehud Barak, who infamously described Israel as “a villa in the jungle,” have fancied the Israel as a European style nation-state outpost in an otherwise uncivil Middle East. This socio-cultural legacy is manifest in a variety of ways. It’s enormously telling, for instance, that Israel is the only Middle Eastern country that chooses to compete in the annual Eurovision Song Contest, as well as the European soccer and basketball championships. At the end of the day, though Israel and the EU may experience their fair share of political tensions, Israel is a European country at heart in so many tangible and intangible ways. Israel has been also proving itself all-too European in a decidedly different way: through the the nationalist racism that plagues its civic life. To cite but one example, Israel has its own brand of European-style racist soccer hooligans who cheer on their teams by violently attacking minorities in the streets. 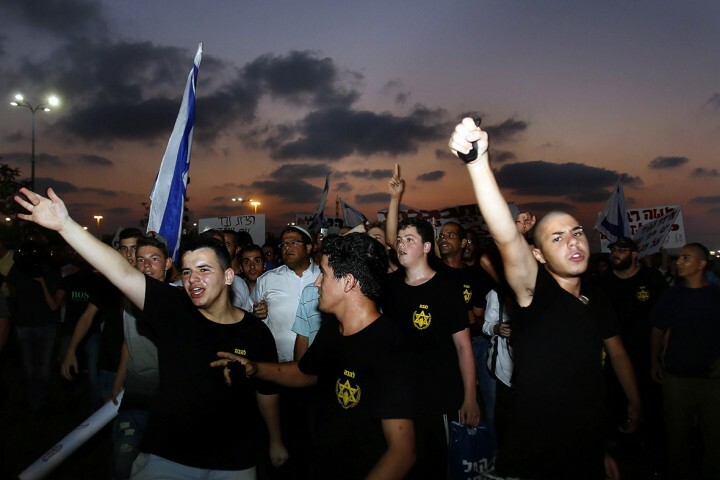 Hundreds of Beitar Jerusalem supporters assaulted Arab cleaning personnel at the capital’s Malha shopping center on Monday, in what was said to be one of Jerusalem’s biggest-ever ethnic clashes. “It was a mass lynching attempt,” said Mohammed Yusuf, a team leader for Or-Orly cleaning services. Initial reports suggested that some of the suspects in Abu Khieder’s killing were connected to La Familia, a notorious wing of soccer fans connected to Beitar Jerusalem, one of Israel’s more prominent soccer clubs. La Familia… has come to define the club to outside observers as a bastion of xenophobia and racism in Israel. Some of the right-wing protesters who beat leftist demonstrators in Tel Aviv on Saturday night wore T-shirts bearing a neo-Nazi symbol, photos and videos show. As troubling it is to read of shootings and firebombings, I believe we should be far more disturbed when we hear reports of far-right and even neo-Nazi candidates being elected into Parliaments throughout Europe. So too we should be equally as troubled by the increasing numbers of high ranking racist Israeli politicians who incite violence against Israel’s African immigrants, call for the transfer of Palestinian citizens of Israel out of the country, or introduce legislation that effectively force non-Jews out of its political life. Statements like this make it clear that Israel is not merely a European-style nation – it is a nation that dances with some of the darkest aspects of European ethnic nationalism: i.e., a nation founded exclusively upon the identity of one group and that ipso facto treats its non-majority population as other. I want to make very clear that the Jewish community has been in this country for centuries… They belong in Denmark. They’re part of the Danish community and we wouldn’t be the same without the Jewish community. I want to make very clear that the Palestinian community has been in this country for centuries… They belong in Israel. They’re part of the Israeli community and we wouldn’t be the same without the Palestinian community. And in so doing they are, in a very real way, opting into the power and privilege that comes with being the majority oppressor class in a different kind of European country. This entry was posted in Anti-Semitism, Current Events, Denmark, Europe, France, Israel, Palestine, Racism, Terrorism, Zionism on February 18, 2015 by Rabbi Brant Rosen.